One of them is a trim 79-year-old whose still-spry voice and white teeth don’t seem to have aged at the same pace as his weathered face. The other is a 74-year-old who seems to have aged to the point where his face and body stand as a harsh rebuke to every trace of youthful grace. 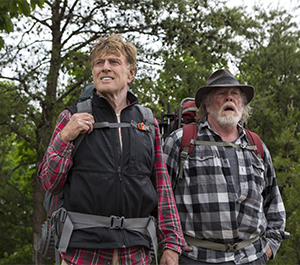 I’m talking about Robert Redford and Nick Nolte, the unlikely pair of actors who try out their version of a Grumpy Old Men routine in A Walk on the Woods, a comedy in which an aging travel writer decides to take a re-invigorating 2,118 mile hike on the Appalachian Trail. When Redford’s Bill Bryson can’t find a partner to join his adventure, he settles for the company of Nolte’s Steve Katz, an alcoholic who only recently put aside the bottle. As young revelers, Bryson and Katz once traveled in Europe together. The duo long-ago parted company. Katz continued his dissolute life in Iowa. Bryson stayed in England where he met and married a nurse (Emma Thompson). The couple now lives in New Hampshire, where Bryson tries to avoid funerals, treats the world with cynical indifference and occasionally writes a forward for someone else’s book. At one point, Bryson’s wife suggests that he talk to people. Bryson says he doesn’t like to talk to people, an unlikely trait for a supposedly great travel writer and an indication of missteps to come. Under the uninspired direction of Ken Kwapis (He’s Just Not That Into You and License to Wed), Walk in the Woods turns into a broadly conceived comedy that wanders a long way from the kind of chemistry generated by Redford and Newman in movies such as Butch Cassidy and the Sundance Kid (1968) and The Sting (1973). I can’t imagine what Walk in the Woods would have been had Newman lived long enough to play opposite Redford again, and I’m glad that I can’t. I really don’t want to think about it. Beyond that, I’m a little surprised that Redford, who served as one of the movie’s producers, was attracted to material that required him to cover himself with mud, fall into a rushing stream and tumble over a cliff that brings him and his slovenly partner to the brink of a death defying leap which — unlike Butch Cassidy and Sundance — Bryson and Katz wisely avoid. Even though Nolte’s voice has devolved into a cross between a garbage compactor and a growl and Redford’s chops don’t necessarily stretch toward the movie’s occasional displays of physical comedy, both actors know how to handled themselves on screen. Still, they can’t overcome a trail of second-rate material that — like the Appalachian — could stretch from Georgia to Maine. The movie’s more serious moments — Bryson and Katz sharing thoughts on what their lives have meant — feel worn out. Every now and again, Bryson stops the story in its tracks to deliver a small lecture on the fate of disappearing varieties of trees or the staggering multiplicity of stars in the heavens. Aside from a few brief appearances by other actors, A Walk in the Woods remains a two-hander. Kristen Schaal plays a female hiker whose presence grates on Bryson and Katz’s nerves, and ours, too. Mary Steenburgen brings her luminous smile to the role of a motel owner who flirts with Bryson. A jokey bit about an overweight woman who becomes the object of Katz’s lascivious desires takes on an ill-fitting antic quality. At times, A Walk in the Woods seems like a goofy east coast version of Wild, the movie in which Reese Witherspoon played a woman who took a solo hike on the Pacific Crest Trail. In some respects, A Walk in the Woods could have taken its title by going in the opposite direction from Wild. This one is harmless, and that’s a shame for Redford and Nolte, both of whom are capable of better.